Yep, I reckon it’s time I presented you guys with another sports joke. In honour of the 2014 Fifa World Cup I think it’s only fitting that soccer jokes should be the focus of this weeks Sports Jokes. The scouts are a very important factor of any top sport team Their job is to find up and coming sport stars who will hopefully make their team a finals contender. The following soccer joke is about a talented soccer player recruited by the Liverpool scout. It turns out that Liverpool has a well-known goalscoring problem. In an effort to solve the problem they send their top scout around the world to look for some top talent. Around the end of his trip, he stops over in Baghdad where he happens to see a young Iraqi lad playing on the street. The kid is phenomenal, so the scout recommends him to Brendan Rogers. Liverpool sign him to a one year contract and the kid joins the team for the preseason. It’s the opening game of the season and Liverpool are down 3-0 at home, with only 15 minutes left. With nothing to lose, Rodgers gives the kid the nod and the young Iraqi runs onto the pitch, replacing Luis Suarez. The kid is a sensation – scores 4 goals in 15 minutes and wins the game for Liverpool! The fans are delighted, the players and coaches are delighted and the media love their new star. I got this one in an email the other day. 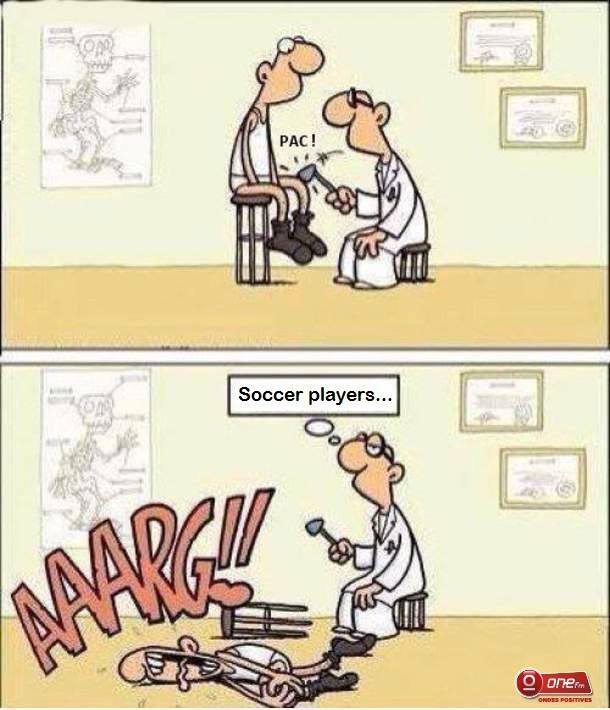 This soccer joke really made me smile. Finally, I want to share with you a really funny video. This particular video was put together by some guys who go by the name Dude Perfect. They’ve put this video together in honour of The 2014 World Cup. I absolutely loved it when I saw it and I know you will too. If you loved that video as much as I did you should check out the Dude Perfect Channel.